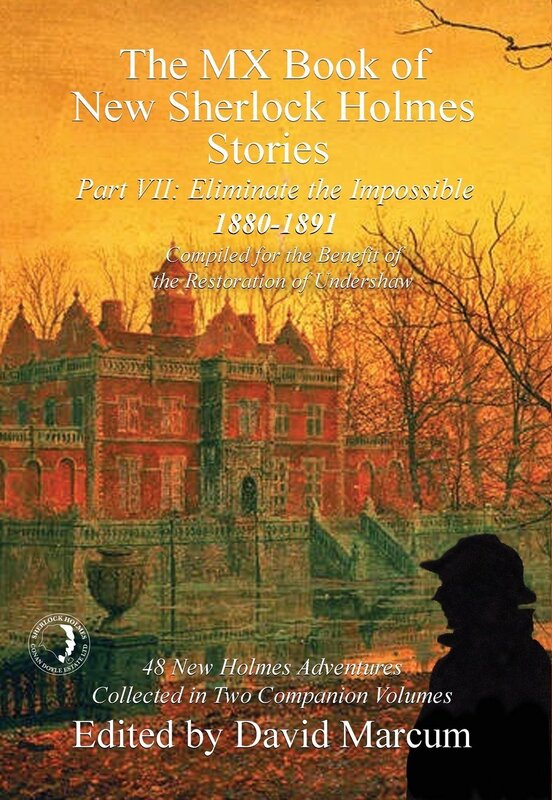 Another new collection of 48 Holmes stories published to help preserve the former home of Sir Arthur Conan Doyle. This will be released concurrently with Part VIII on October 31, 2017. Part VII - Eliminate the Impossible: 1880-1891 features contributions by: Mark Mower, Jan Edwards, Daniel D. Victor, James Lovegrove, Gayle Lange Puhl, Thomas Fortenberry, Mike Hogan, Thomas A. Turley, Adrian Middleton, James Moffett, Hugh Ashton, Geri Schear, S. Subramanian, John Hall, Jayantika Ganguly, S.F. Bennett, Steven Philip Jones, Jim French, John Linwood Grant, Mike Chinn, Robert V. Stapleton, Charles Veley and Anna Elliott, and Shane Simmons, with a poem by Jacquelynn Bost Morris, and forewords by David Marcum, Lee Child, Rand Lee, Michael Cox, and Melissa Farnham.